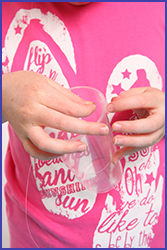 This is one of those cool magic tricks for kids and well worth the effort. Take your time and make it carefully for the best effect. 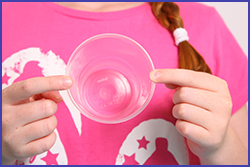 Use a soft plastic cup for the best results. There are some tricky bits that you may need an adults’ help with, so have a grownup nearby. Be careful when working with the thumbtack. Take extra care when you are using the pliers. The rope that works best for this (and loads of other very cool magic tricks for kids), is called ‘magician’s rope’. It is cotton rope that have been cored. Magician’s rope is available to buy on the internet from lots of different shops. Ask a grownup to help you look for it on the internet. 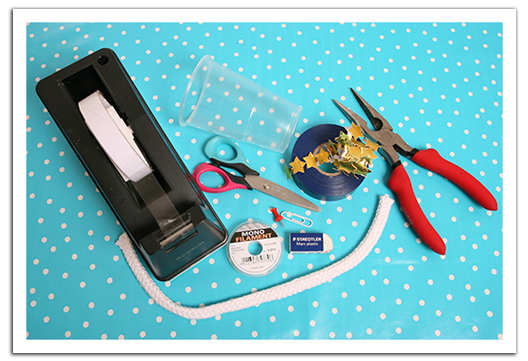 The ‘mono filament’ that is used to make this trick is often used to make jewellery and you can get it from most craft shops. You can also use lightweight fishing gut from an angling shop. Now do Step 1 again, exactly opposite the first hole. This is important because if the holes aren’t exactly in the middle of the cup, the finished effect will not be as successful. Ask help if you are struggling with this step. You are now going to thread a length of the mono filament (about 30 cm) through the holes. You need a steady hand for this! Start on the outside of the first hole, though the inside of the opposite hole and out on the other side. Your cup should now be able to hang in mid air if you hold the two ends of the mono filament. Now you are going to tie the two ends of the mono filament together. You need to make sure that you tie the knot nice and tight, make it a double double knot. The thread that is now stretched across the top of the cup needs to be tight. This thread is what will be holding the rope attached to the glass. Decorate the top of the cup with some colourful tape. This disguises the mono filament and add a ‘magical’ touch. 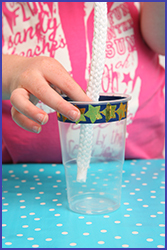 Now we are going to prepare the rope for the floating cup trick. 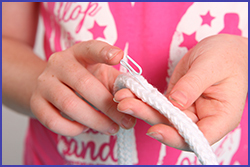 Firstly, you need to stop the ends of the rope from fraying… This will make sure that you can use this trick again and again. The way it is done is by wrapping see-through sticky tape around the ends. See the step-by-step pictures below. Remember this method for any other rope tricks that you may learn and do in the future. The next step is to prepare the ‘hook’ that will make the cup float. This is done with the paperclip that gets bent into a hook and this fits into the rope as the ‘gimmick’. 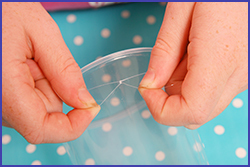 You may need help from an adult with this step as it is a bit tricky and you need a pair of pliers to cut the extra bit off. We now need to measure where the paperclip needs to go into the rope. The way you do this, is by placing the rope inside the cup and lift it about 1.5 cm to 2 cm from the bottom of the cup and mark where it meets the mono filament on the rope with your finger. This is the place where we are going to put the ‘hook’ into the rope. Push the long end of the paperclip hook into the rope you have marked in step 6. 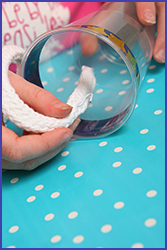 Make sure that it is pointing down into the cup (inside the rope) so that the ‘hook’ can hook onto the mono filament. You are now ready to do the floating cup trick. 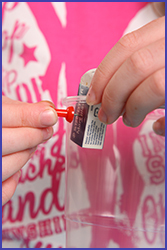 This is one of those super cool magic tricks for kids. Go and have loads of fun with it! An idea is to look over the video again for some performance tips. You may also be able to get some ideas for ‘patter’ to go with the performance. 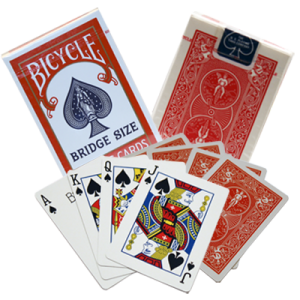 ‘Patter’ are the words you say or the story you tell when performing a magic trick. This makes it even more entertaining for your audience and the trick will be more effective. My son is currently working on this trick to show his grandparents over the webcam, great job Kristen and Kelly! Wow! That is great to hear. Let us know how that goes!